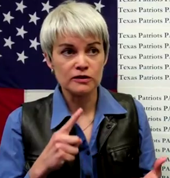 Julie Turner, President of the Texas Patriots PAC, talks about the unique debate between Herman Cain and Newt Gingrich and also why this format is so important for conservatives and for our country. The debate takes place this Saturday, November 5, in the Woodlands at 7pm. Full Transcript: The American people have a huge decision to make coming up, and we are not getting the information that we need out of the Presidential Debates. When we have a train about to hit us in the form of Medicare, Medicaid, Social Security, we know it's coming, and we have these debates with all of these people up on the stage, and they get just a couple of minutes to answer a question about what is probably the most important issue to face the next president, we feel like that deserves a good honest in depth discussion. So we got together, just the group of people are, all volunteers, and we made this offer to two incredibly brave men who are willing to go in depth on these discussions about their plans to debate each other about the merits of each other's plans, and I think it shows a great deal of respect for the American voters. That's why this is potentially one of the most important events in this election cycle.